Hmm. This was a tough book to rate for me. 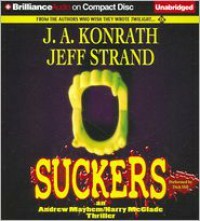 I really enjoyed Jeff Strands chapters, Andrew Mayhem will always be a favorite character of mine, but this was my second time reading J.A. Konrath and I'm still not a fan. Harry McGlade was just so unlikable, and I get it we're not suppose to like him, but I can't read a book about a character that I wish somebody would shove off a cliff and enjoy myself. I need at least one redeeming character trait or some background character that's likeable. So if I had to rate this based on the stories with just Andrew Mayhem, it would be a 4 1/2. Based on just the Harry McGlade stories, it would be a 1/2 star and possibly a DNF. The final story including both characters I would have rated a three. If you take the average of those three numbers, you get 2.66666, but since this site doesn't allow you to be that specific, I rounded up to three stars.